Large and powerful, the Neapolitan Mastiff is known for its massiveness massive head, massive bone, and massive body. Despite their fierce appearance and serious demeanor, Mastiffs are generally peaceful, steady dogs. The breed’s trademark is the loose skin that covers their bodies, the abundant wrinkles and folds on the head and their rolling and lumbering gait. Their short coat can by gray (blue), black, mahogany and tawny. Some brindling and white markings are allowed. Training should be easy, as long as you have a firm hand. An ancient breed, the Neapolitan Mastiff’s lineage can be traced back to ancient Egypt, Persia, Mesopotamia and Asia to the dogs of war used by the Roman army. The breed later existed on estates and farms in northern Italy, designed to be imposing in appearance for use as a defender of owner and property. Well-bred and socialized Mastini are steady and loyal to their own families but protective around strangers. 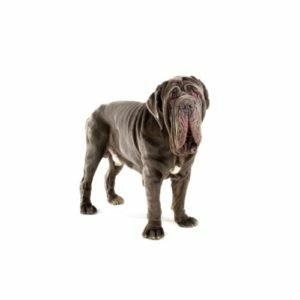 Due to the breed’s size, strength and temperament, experts do not recommend a Neapolitan Mastiff for first-time dog owners or families with young children. They should receive some form of daily exercise, but beware that they don’t overdo it in hot weather. Their short coats are easy to care for, but potential owners should not be afraid of a little drool! Are you interested in purchasing a Neapolitan Mastiff?